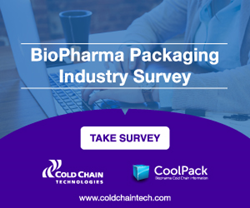 Cold Chain Technologies (CCT), a leading global provider of temperature-controlled packaging products and services in collaboration with CoolPack.com today announced the release of an industry wide survey intended to benchmark the methods used to maintain the efficacy of temperature sensitive therapeutics throughout the supply chain. “The biopharmaceutical industry is in need of value added insight into navigating a rapidly changing landscape. This survey aims to shed light on a global scale with the intent of delivering useful and applicable results,” states TJ Rizzo, Senior Vice President of Global Commercial Operations at Cold Chain Technologies. Ongoing mergers and acquisitions, organizational restructuring and shifts in organization focus has led to many questions about the structure of packaging and engineering functions. The survey will run from July, 25 2016 until September 30, 2016 with the results being shared in October 2016 directly to respondents and publicly via a formal report that will also become available on http://www.coldchaintech.com and http://www.coolpack.com. Cold Chain Technologies (CCT) is a global developer and manufacturer of controlled-temperature distribution solutions for the pharmaceutical, biotech, health care and medical device industries. Distributed from multiple U.S. and international locations, CCT’s trusted brands include Koolit® Refrigerants, KoolTemp® GTS Pre‐Qualified Shipping Systems and KoolTemp® Insulated which are available in a wide range of sizes, duration's and temperature ranges. For more information, please visit http://www.coldchaintech.com. Since 2007, CoolPack.com intends to be the best informational resource for the BioPharma cold chain packaging & distribution professional community with the primary objective of providing value to cold chain professionals. CoolPack.com has been created by industry professionals, for industry professionals. We strive to provide a centralized location for everything cold chain related, from industry events, white papers, articles, guidance documents, tools, company and product information. For more information, please visit http://www.coolpack.com.